In 1813, Lewis Wernwag, the owner of the first iron company, was looking at his furnaces one evening from a nearby hillside and saw a Phoenix in the flames. This vision inspired him to rename his company Phoenix Works. 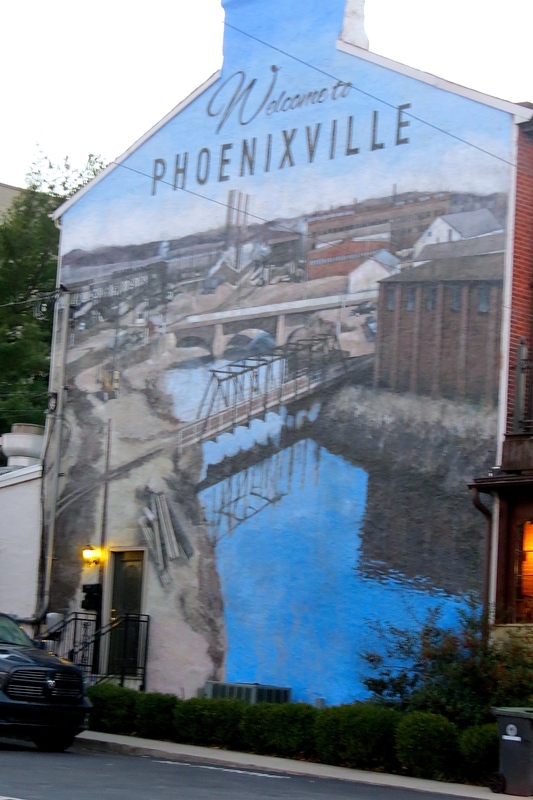 When the community that grew up around the iron works became incorporated in 1849 the name Phoenixville was a natural choice for the new borough. From this story, arises the Firebird Festival, which has become an annual tradition. The original firebird myth dates back to the Egyptian and Greek cultures. Greek legend recounts the story of the Phoenix: a magnificent bird, which lived for a thousand years, built a pyre, only to be consumed by its flames but then reborn from the ashes. That’s a dramatic story, for sure, and I have to give the citizens of Phoenixville credit for reenacting the myth. The effort brings community members together to build the structure, plan the parades and manage the logistics of such an endeavor. Not unlike the myth, Phoenixville had to resurrect and remake itself when all the mills closed. Economic stagnation pulled the town down into a decline. In recent years, however, the city has undergone a rebirth with new shops, restaurants and clubs lining the main street. The Old Foundry Building, 120 years old, now houses the Schuylkill River Heritage Center, and the Phoenix Village Art Center occupies a storefront on Bridge Street. Phoenixville embraces their mythological heritage. Colorful murals of the Phoenix greet visitors driving through Bridge Street. 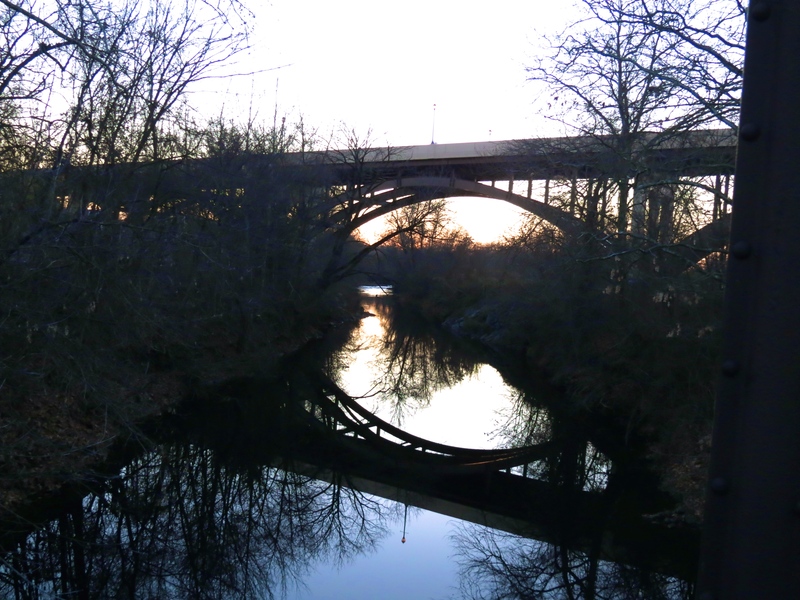 Behind the interpretive center, the Schuylkill River Trail winds along the bank of the river. The trail begins in Philadelphia and ends in Pottsville. 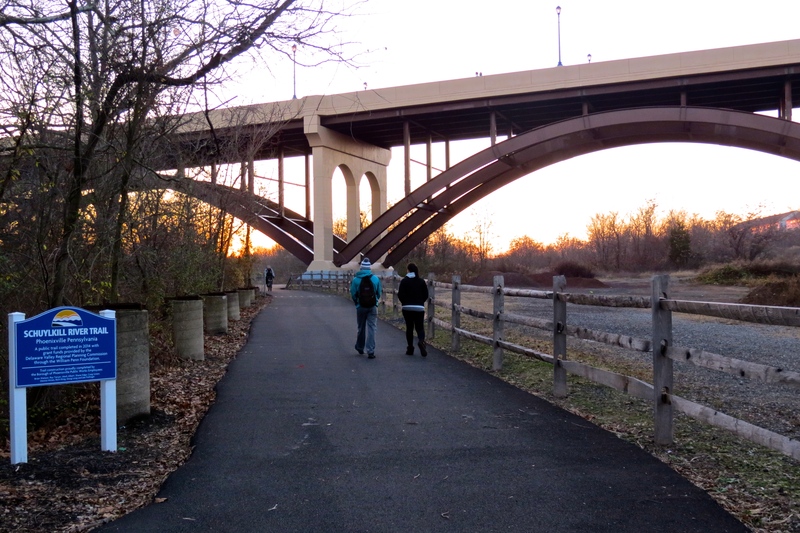 The path leads under Bridge Street, the arching curves framing the surrounding landscape. I walked back into town and stopped in several of the shops. Along the way, the Kingsessing Morris Men performed a unique stick dance under the marquee of the Colonial Theatre, once a vaudeville house built back in 1903. The K-Mens’ costumes included a top hat with spiky feathers and shaggy bits of colored cloth draped down the front of their coats. The energetic dance, with accordion accompaniment, looked like so much fun to perform with their skip, hop and hit! From the parking lot, I boarded a toasty warm school bus for transportation to Friendship Field. White tents surrounded the giant bird and offered gourmet food, local crafts and music. Fire eaters amazed the crowd with their breath acting as torches, shooting flames six feet into the air. Performers looped hoops, staffs and fans around their bodies, flames spinning out from all directions. The parade entered into the center ring led by torch bearers, drummers and dancers as giant bird puppets waved their wings over the crowd. Finally came the moment went the torch lighted the inside of the Firebird, making “a fire in the belly” transform from metaphor to reality. The crowd cheered as the bird ignited and flames spread, while cascading orange sparks flew into the night sky–truly a spectacular recreation of the legendary Phoenix consumed by fire. Next year the community will resurrect the wooden bird once again, completing the myth cycle. For another very dramatic effect: mute the sound on the video, then slide the audio clip below to 111 to start, begin video and audio together. Stravinky’s Finale to the Firebird Suite will play to the end as you watch the video! Special thanks and appreciation–to friends, Joe and Dan, for their participation, and to all those on the Firebird committees–for making this event possible! When Springfield was founded in 1686, most of the residents were farmers. 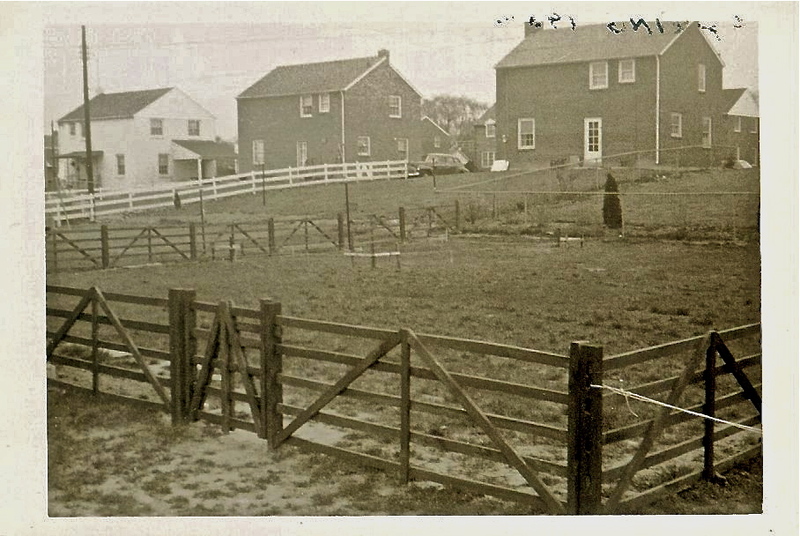 In the 20th century, developers bought up most of this farmland, and our little neighborhood was carved out of the land for the growing post-World War II population. 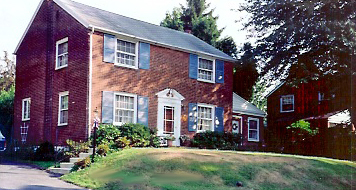 Memories of my childhood begin to focus when my parents purchased a house on Briarhill Road, Springfield, Pennsylvania. Most of Springfield had been farmland, but the demands of the baby boom generation changed the landscape as families began to look for housing in suburbia. 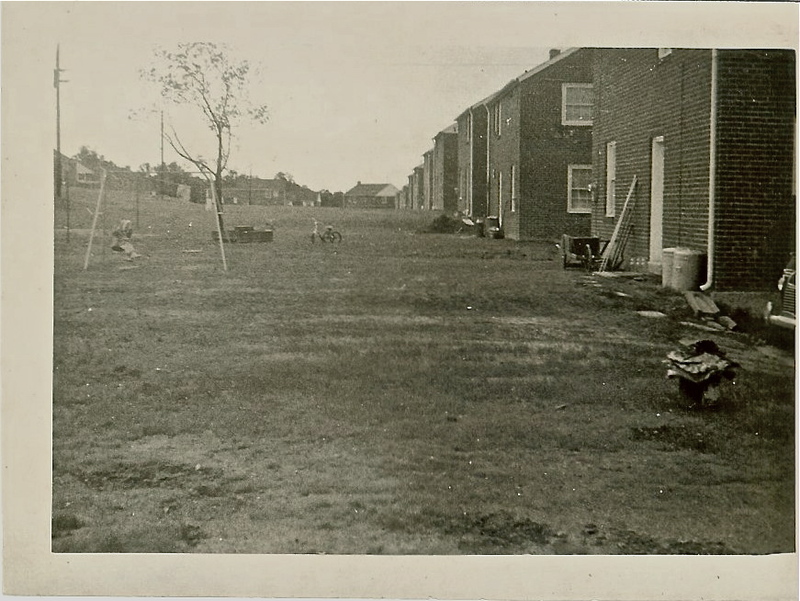 Woodview Farms, the name given to the three streets in the development (Briarhill, Wheatsheaf, and White Oak) formed a circle with one flat side, the hill at White Oak. The developer flattened the land, leaving only a few older trees here and there. Our home was the fifth one up on the left side, purchased for $11,500. My parents paid sn extra $500 for the side porch. About 2 1/2 years old, I’m standing next to Mom, a few months before she delivered my sister in October. Mom, drawing from her Scottish legends, always believed they would have good luck with this home, as a cricket greeted them on the steps. These houses were typical of the box colonial style that builders relied on for quick production and ease of construction. Local ordinances required that the builder vary the styles, at least slightly. Some houses were painted white, some had patios or porches on the front or side. The houses on White Oak had garages built into the front. However, a number of construction-related problems surfaced fairly quickly for the new residents. As a result, the neighbored established the Woodview Farms Civic Association to address their grievances collectively. 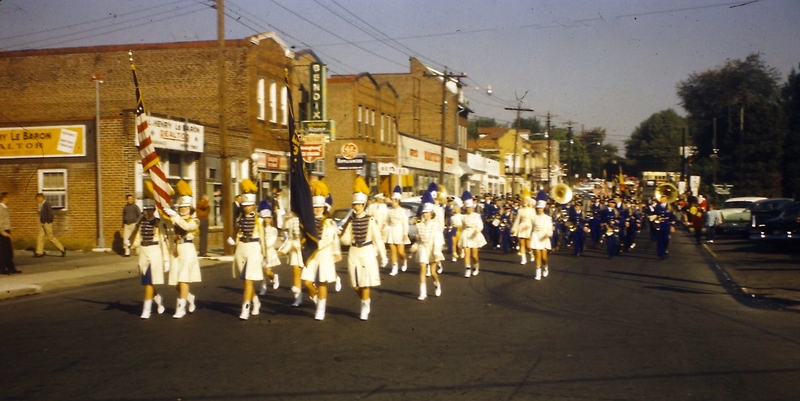 Later, the Association served as a social organization, planning 4th of July parades and other celebrations within the community. In the picture above, we are walking away from our house, about half way between White Oak hill and the curve into Wheatsheaf. Woods lined the back of the homes on the left side almost to Woodland Avenue. By the time my sister was born on October 15, 1950, grass had been planted, along with a few shrubs along the front, inclusive in the sales agreement. Every house had the two evergreens on either side of the front door. Note the lack of automobiles on the street. 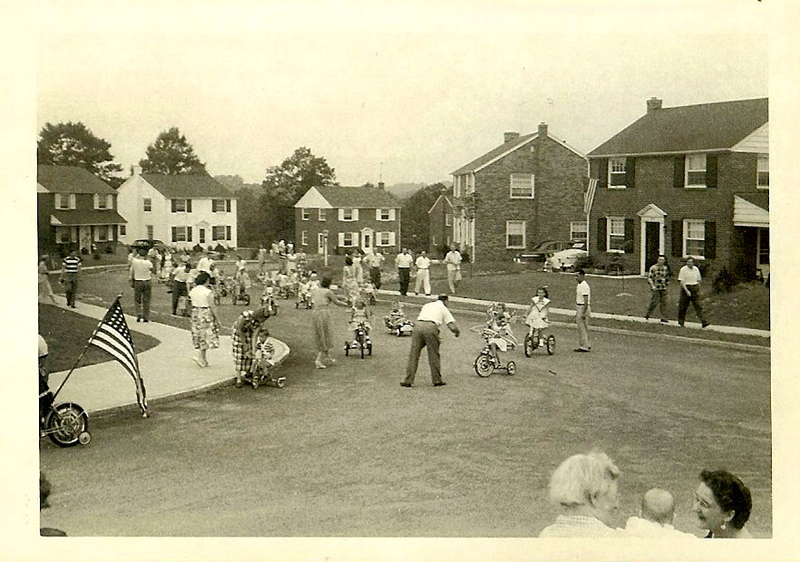 A working class community in 1950, most families did not own a car. 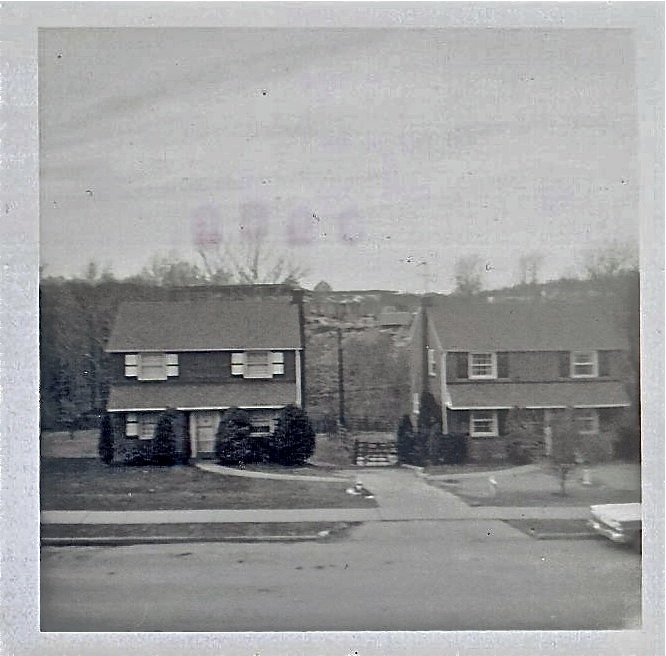 This photograph was taken in our backyard, from which we could view every house in the inner circle. 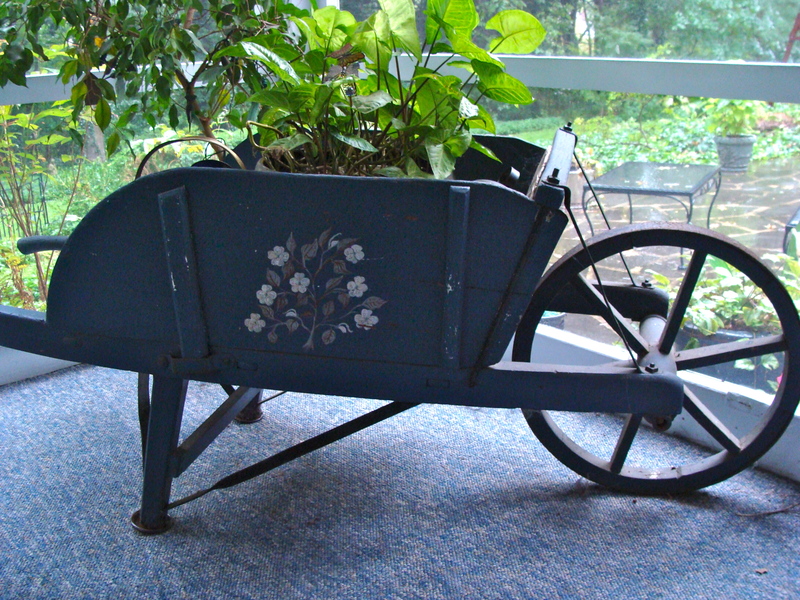 I still have my Dad’s wheelbarrow, which is parked along the back of the house. 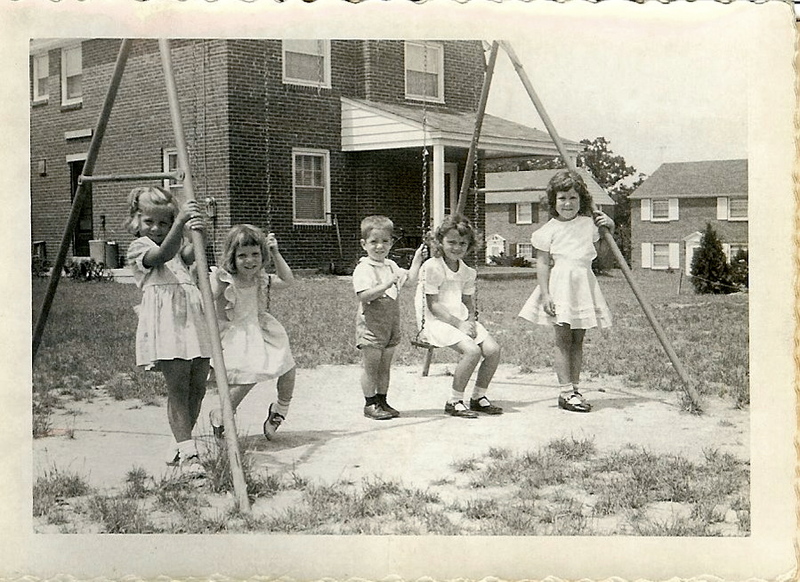 I believe I might have been the first kid on the block with a swing set. The 50s had arrived. A sidewalk cut through our neighborhood to Woodland Avenue, Route 420, a major roadway to towns east and to the airport. At the end of the sidewalk on the left stood the Woodland Inn, a rustic bar that had been in that location for years. Once, I fell off my bike in the parking lot, with the resultant bloody knee and elbow, and the kind bartender gave me a band aid and a ginger ale. 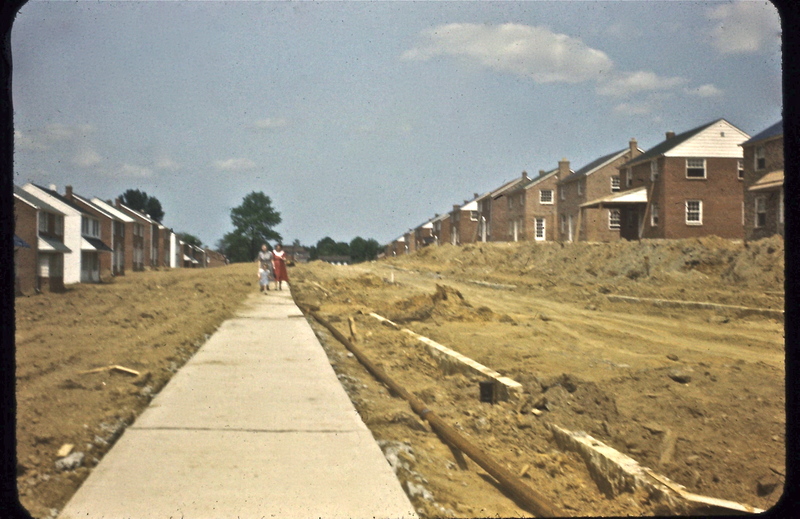 In the late 1950s, developers built a small strip of stores on the field on the left side of the sidewalk. Many businesses, including a toy store, hairdresser, orthodontist offices and M&M cafe went in and out of those shops. 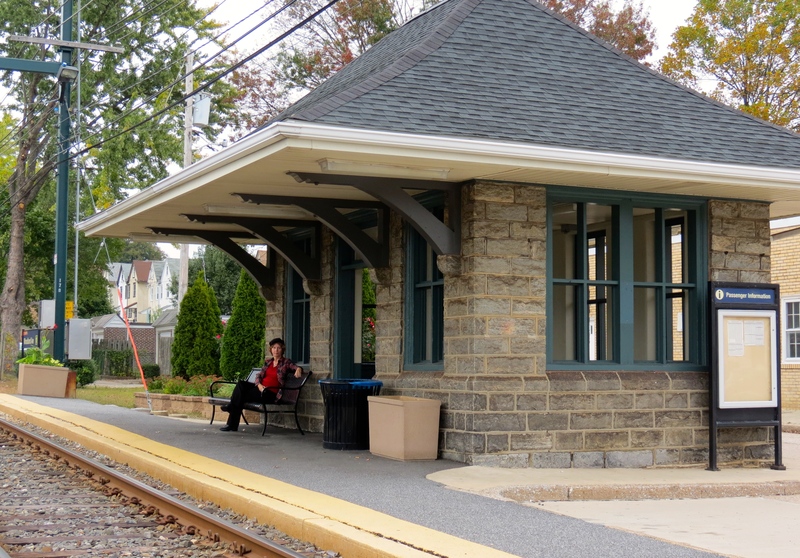 The Red Arrow Line trolley stop was also on Woodland Avenue. Access to public transportation was important so Dad could commute to his workplace at the RCA plant in Camden, New Jersey. Planted on the other side of Woodland Avenue was another older strip mall. Patler’s Pharmacy and soda shop occupied one corner and was a favorite place to hang out. Inside, a soda station supported a row of swivel seats with green vinyl covers, and we could get the best milk shakes, made the old-fashioned way with milk and ice cream stirred up in one of those mixing machines. As Kathy notes in the comments below, cherry and chocolate sodas were the best-tasting drinks ever. Mr. Patler would stand behind high wooden cabinets supporting bottles of medicine. The pharmacy was still in business in 1979. I went in one day with my son, John, and Mr. Patler was so taken by him, he gave him a toy clown. Photograph taken 2014, exterior, much the same, with different stores. In the middle of the strip, a convenience store sold groceries and cold cuts. Mom often sent me there to buy lunch meats and rolls. However, I was under strict orders not to buy any candy. Next door, Carter’s Hardware Store displayed toys and home and garden tools in their window. As both Joan and Kathy remarked in the comments, Mrs. Carter was known for her gift wrapping skills. We would find any excuse to browse around the store, as Mrs. Carter artfully displayed dolls and their fashions in wooden cases with glass windows. 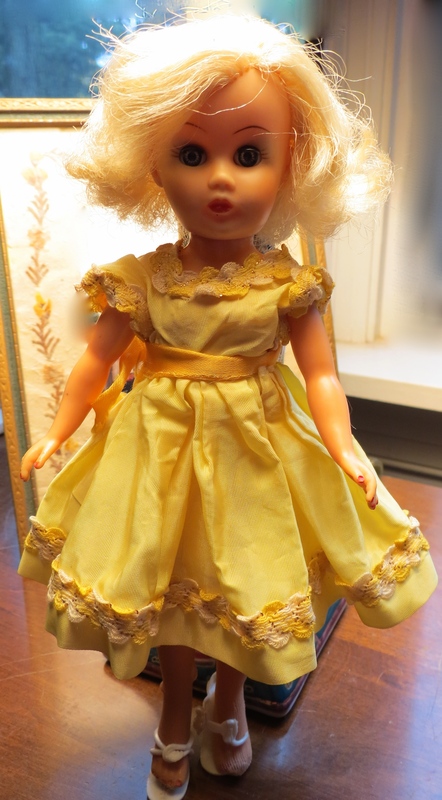 Playing with our dolls, especially the 6-inch Madam Alexander or Ginny dolls, was a favorite pastime. We then collected the high heel fashion dolls, the precursor to the Barbie dolls that followed later. I specifically remember buying this yellow dress at Carter’s because I debated so long as to whether to spend the money. 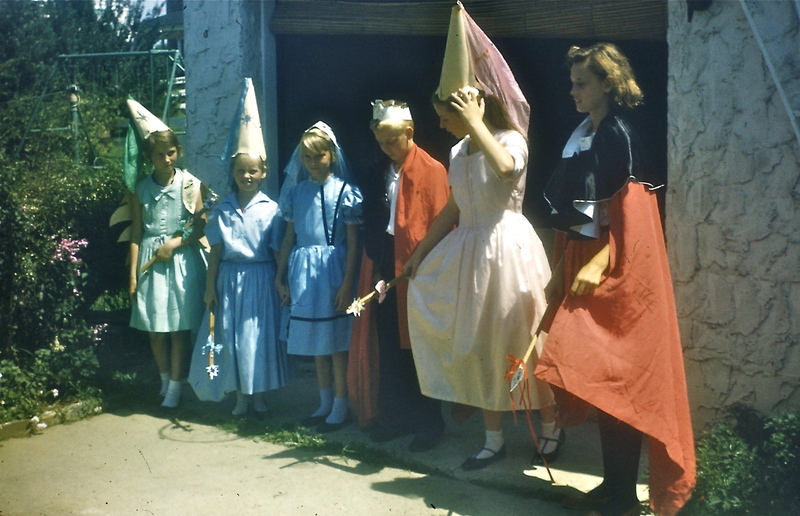 By the time the next year rolled around, neighborhood children had become playmates. 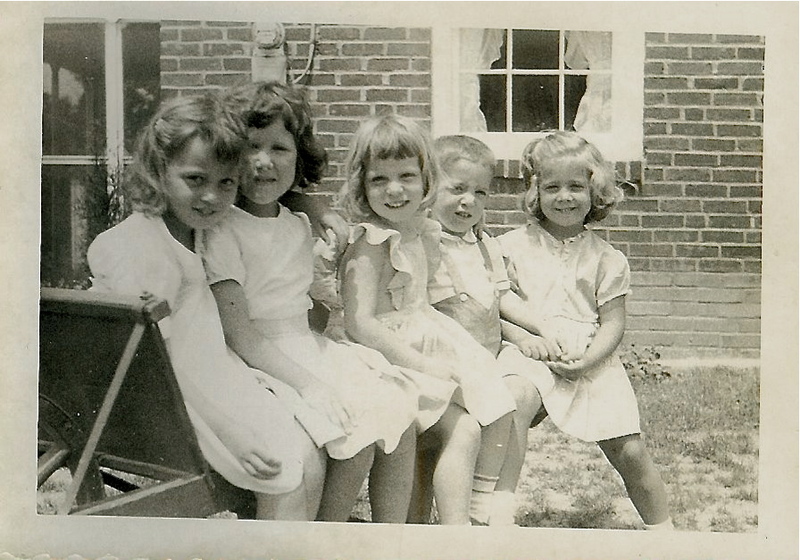 I’m sitting center on the wheelbarrow, and Joan, my long-time childhood friend, is sitting on the left. Joan and I are still in contact today. 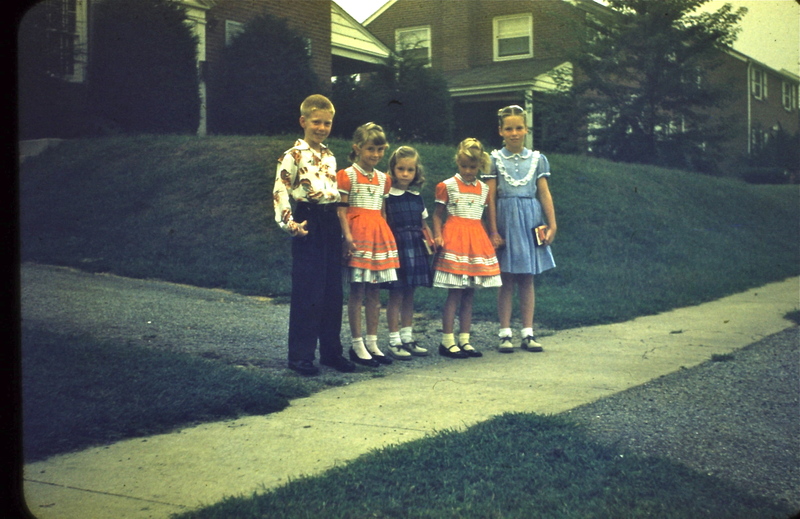 Paul and Mary, the two children on the end, lived next door to us for a few years. I wonder about girls playing outside while wearing dresses. Maybe it was a Sunday? 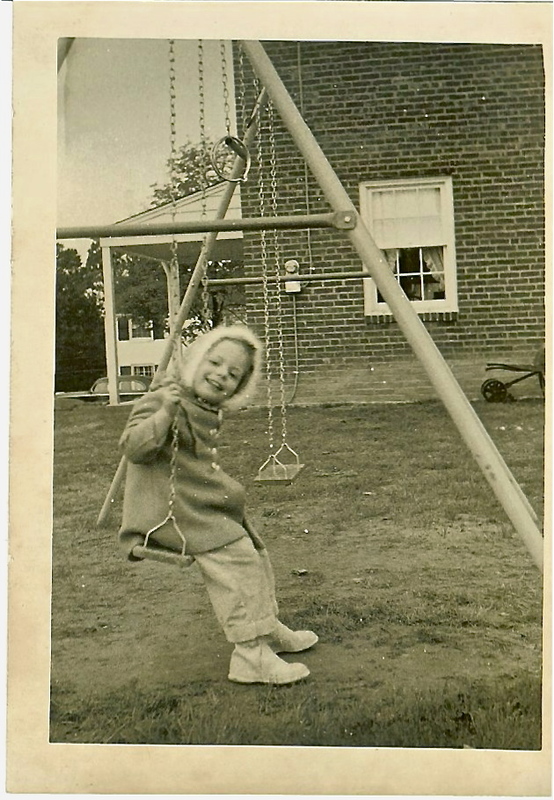 In the post, 1950s Retrospective on Children’s Fashion: Petticoats and Mary Janes, I reminisce about what we wore back then. 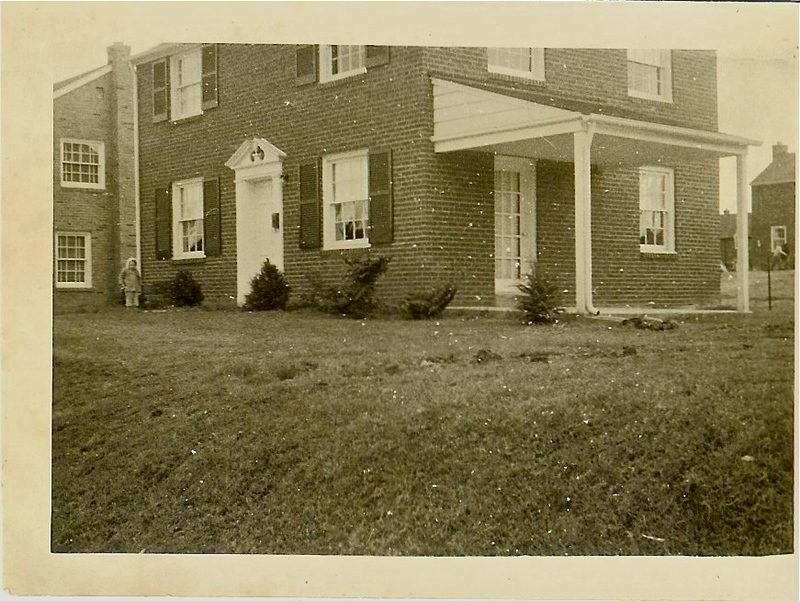 In the second photo just behind Paul, a hand lawn mower rests propped against the house. I remember that my Dad had one, too. What was nice about these mowers: no noise. 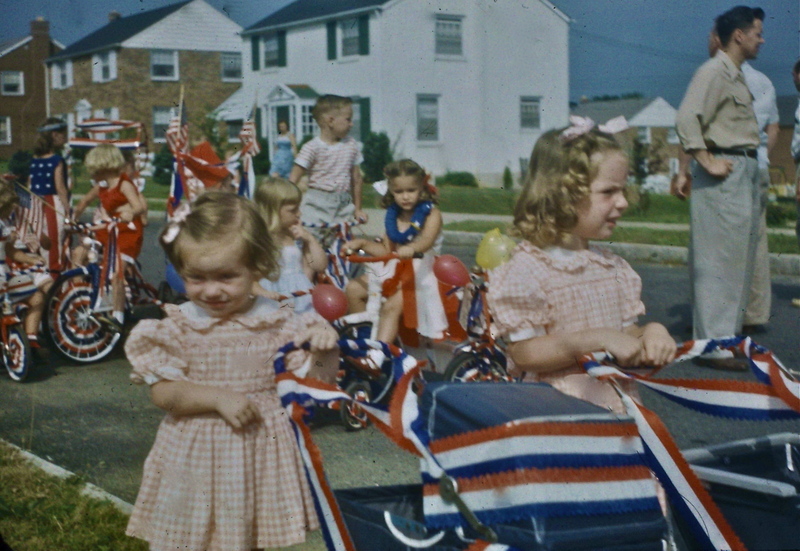 During the summer of 1951, the neighborhood organized their first 4th of July parade for the children, and the tradition continued for at least 50 years. My Dad took these pictures on Wheatsheaf. Two years into the neighborhood formation, fences sprung up, including the dreaded chain link, the bane of aesthetic sensibilities. Is it true that the smaller the plot of land, the more likely people feel compelled to demarcate their territory with a fence? Our next door neighbors had added a room off the back of their house. Dad had begun the process of building our garage as the stakes in the ground marked the footprint. In the color picture below, taken a few months later, piled cinder blocks and other construction materials show up in the yard. Our 194? Plymouth sits on the recently poured concrete driveway. Plymouth had a running board. 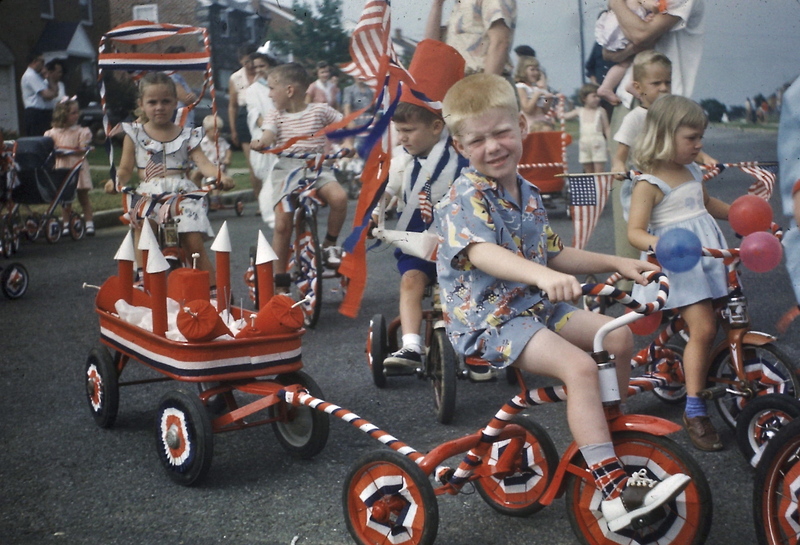 The 4th of July parade that summer had the usual decorated bikes and doll buggies, but David, neighbor from across the street, upped the ante by including a float. The Association was now awarding prizes. 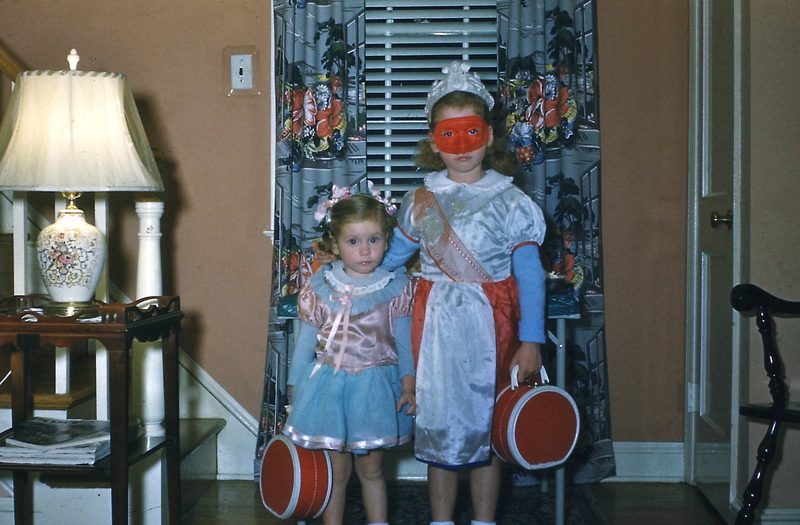 By 1953 Halloween was well-established as a neighborhood tradition. The twins, Carol and Janet from next door, arrive to collect their treat with a few others standing behind the door. 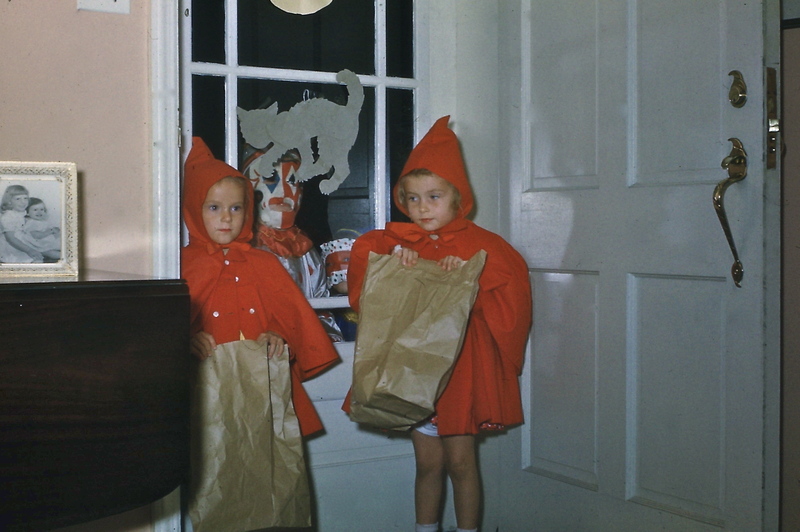 Jean and I modeled our store-bought costumes, but I was not very happy because Mom insisted that I wear a sweater. Everyone knows that a princess does not wear a sweater under her gown under any circumstances! Thus began my compulsion about clothes that don’t match. This next picture triggered a memory about wall paper. Home owners had a choice of having their walls painted or wall papered. The choice of wall paper was considerably cheaper because the builder did not have to “finish” the walls for painting. 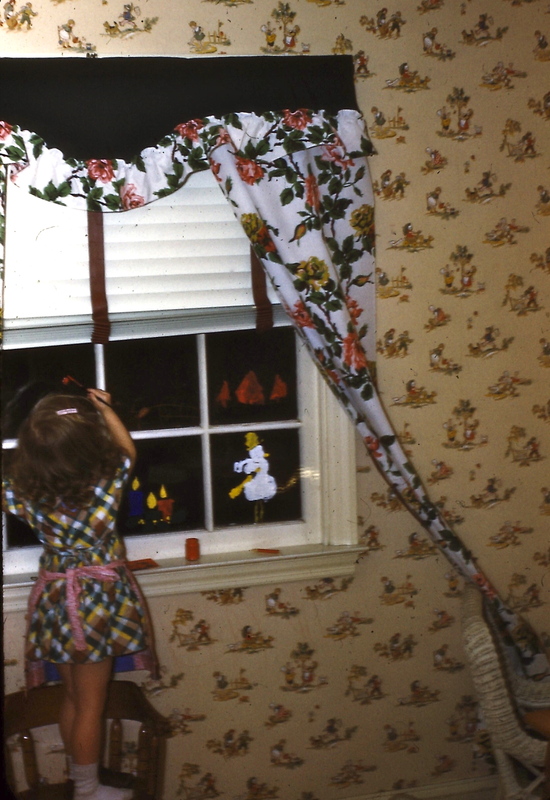 The wall paper was always a choice Dad would regret as scraping it off was tedious and time-consuming. 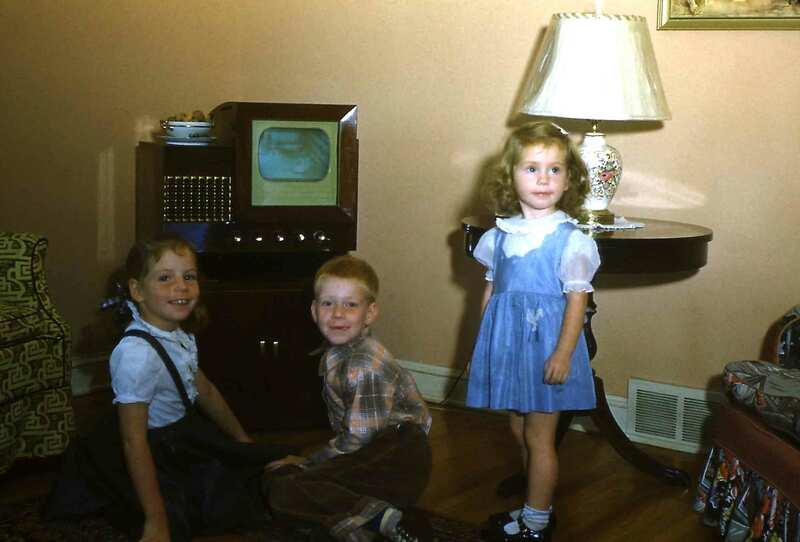 While on the subject of interiors, the television set appears central to the living room. I’ve written several blog posts on television westerns during that time: Lone Ranger and Tonto: A Nostalgic View and Modern Critque and Lone Ranger on Television: Reflections on My Childhood. 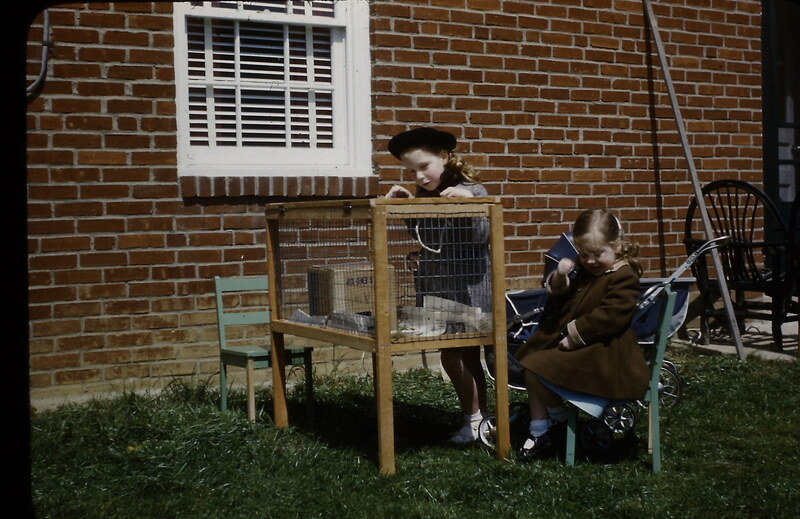 That same year Mom and Dad gave us two bunnies. The neighborhood now included cats, dogs and other assorted animals. Mom had a goldfish bowl that sat on our kitchen window. One of our little rabbits lived for twelve years. 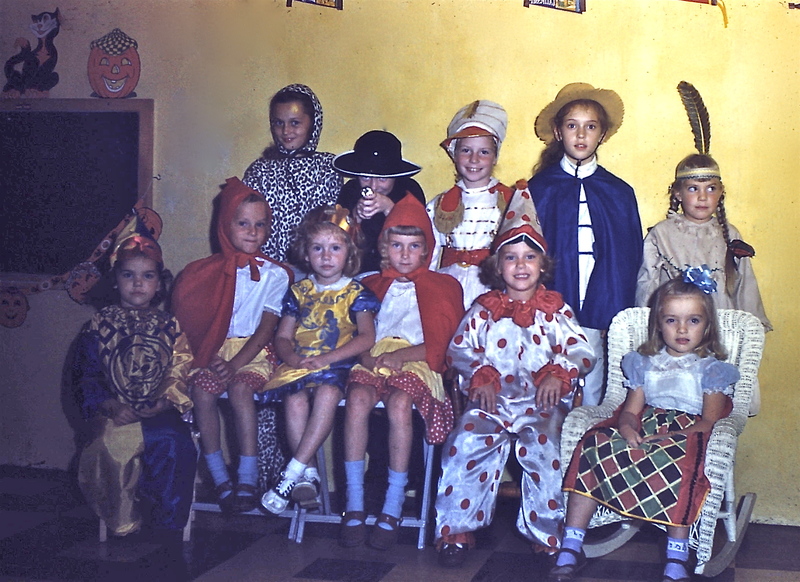 Because my sister’s birthday fell on October 15, we usually had a birthday costume party inviting our neighborhood friends over for a celebration. 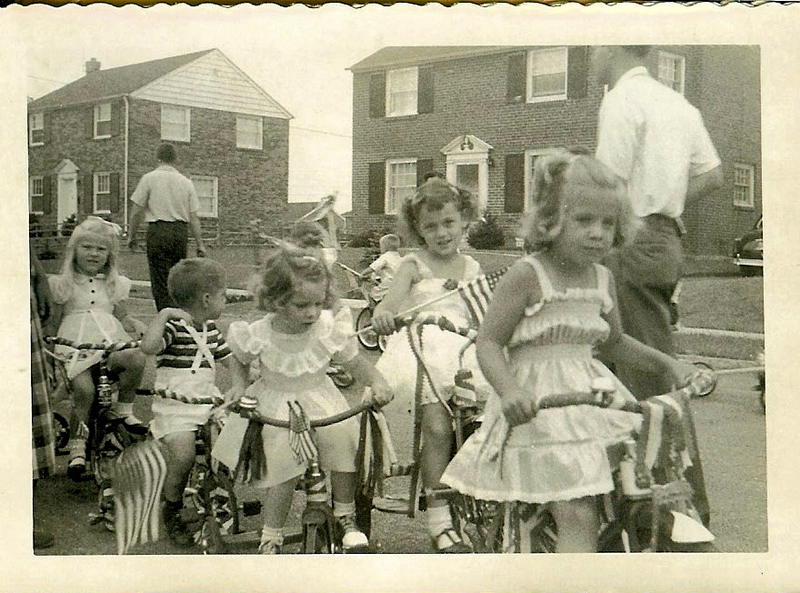 The Civic Association usually arranged for a portable merry-go-round to be part of the neighborhood 4th of July celebration. Although the ride only lasted a few minutes and was certainly a miniaturized version of any other merry-go-round I had ever been on, nevertheless I looked forward to this ride every year. Playing in backyard. Note fireplace in top, left corner. 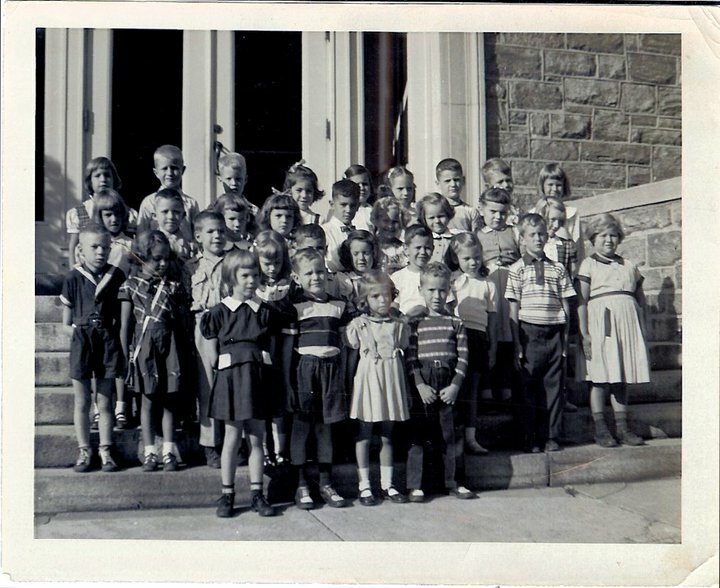 Most of the children in the neighborhood attended Central School on Saxer Avenue, some went to the Catholic school at St. Francis. 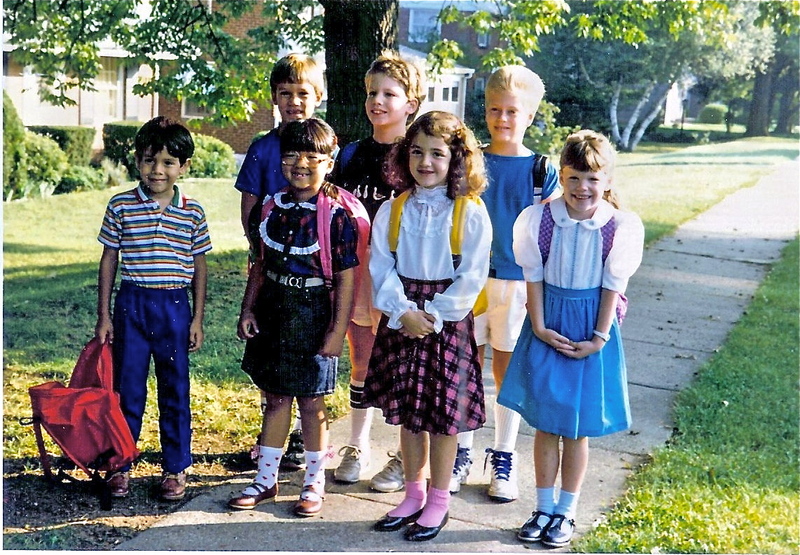 We walked to school, which was about three blocks away crossing at the light on Woodland Avenue. Built in 1920s, each classroom opened with oak doors and hallways lined with woodwork trim. Each room had a huge walk-in closet for coats and boots. The cafeteria in the basement served hot lunches and milk in little glass bottles. The township demolished the school in 1978; a sports field occupies the space now. A Facebook page for Central Schools Alums is located here with pictures of the grand stone building. In those days the fire station’s second floor housed the public library across the street from Central School. This site has several pictures of the firehouse as it looked in the 1950s. As a result of the housing boom, the district built a new elementary school, Sabold, on Thompson Avenue. Because of the street crossings, we now had to take a bus. 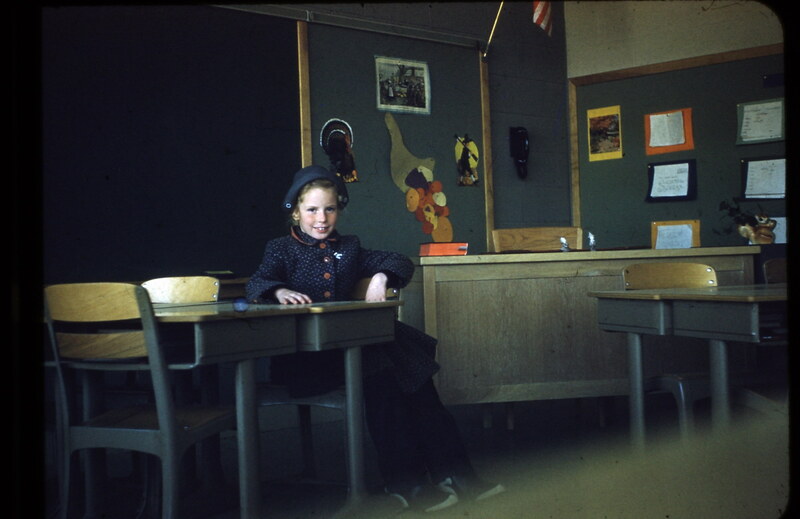 The new school had new features such as a sink and bathroom in every classroom, and we each had our own cubby hole. A rack served as a coat depository. While attending Sabold, I became fascinated by two of the school’s neighboring properties. One was the Blue Church, the oldest standing church in Springfield and adjacent grave yard; and the other was the mysterious research building behind the chain link fence, which defined the school’s boundaries. Students were absolutely forbidden to walk through the church property, but I couldn’t resist wandering through the grave stones looking at the names and dates. I also could not stay away from the small woods that followed along the chain link fence beyond the playground. I always loved any woodsy area, poking under rocks and studying the trees. That area served as a refuge from the school yard dramas. The mysterious L-shaped building, surrounded by trees, loomed on the other side of a high fence topped with barbed wire. Years later I found out it was indeed some kind of research facility. The building was eventually destroyed and the woods cleared for the shopping center where Gernardi’s now occupies that space. (More to come on the subject.) Ironically, I wound up working across from Papazian Hall at Swarthmore College, which was linked to the building behind Sabold. More information at this link. Not long ago my neighborhood friend, Joan, wrote . . . I have such sweet memories growing up in Springfield. Every season had it’s specialty, from bringing May flowers to your special teacher, to the acorns that crunched underfoot walking to Saxer Avenue in the Fall. 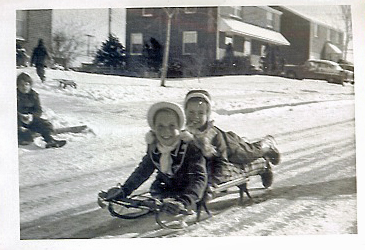 And remember those winters when we lost power but played merrily in the snow, sledding down Wheatsheaf and building forts. Or just simply lying on our front lawns in summertime watching the clouds pass by…where does one begin! I have written about children’s books and our favorite toys at these two links. If you lived in Delaware County, these Facebook pages, The Golden Mile, Delco 19064, Delco Memories, Delaware County PA History and I Lost my Cookies at Playtown Park display pictures of Springfield and area in earlier times. Video of Playtown Park at the link. 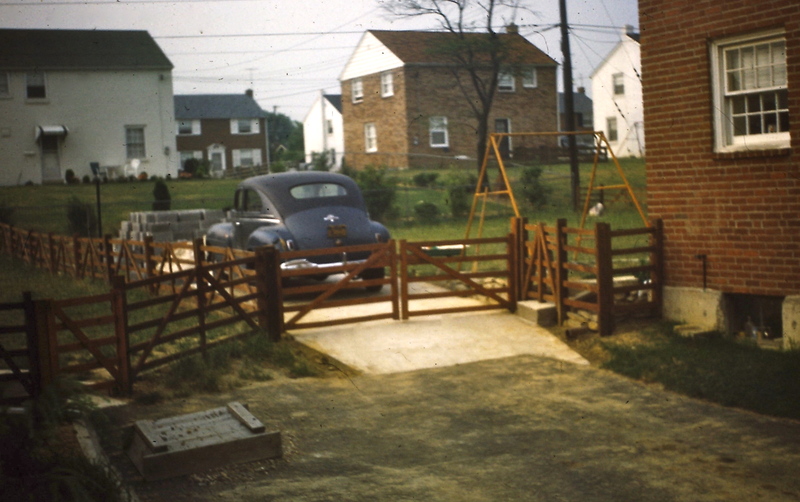 By the late 1950s more cars began to fill up the driveways and streets. Still, most families did not own two cars as the majority of the moms on the block did not work outside the home. This was still the era where the bread man and milkman delivered to the back door. They drove snub-nosed square trucks with bifold doors. The bread man would carry a huge tray of bakery goods. We always begged mom to buy the glazed donuts. Milk came in glass bottles, and we had special little shelf at the back door where mom would leave the empties for pickup. He would also bring to the door eggs, cream and butter. 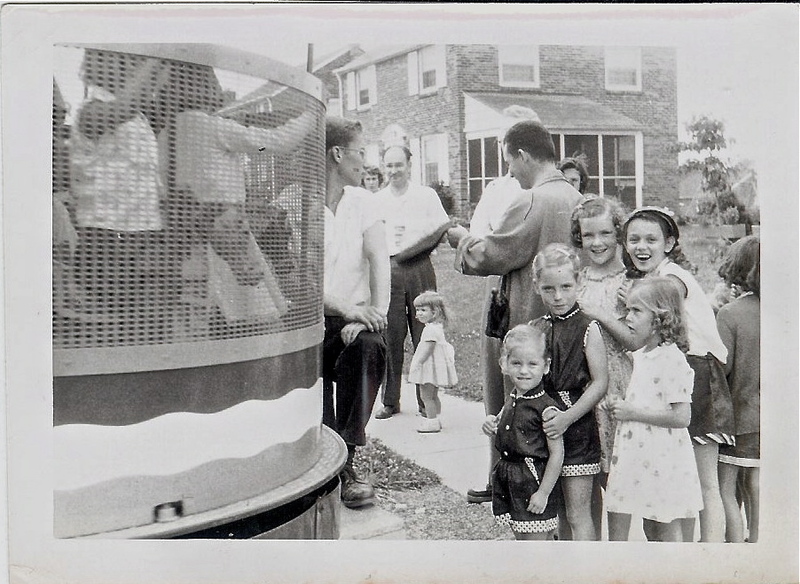 During the summertime, the neighborhood received regular visits from the Good Humor truck, ringing its bell in the early evening. Kids would run out to catch the truck. Couldn’t wait for that Orange creamsicle. The DDT sprayer vehicle usually made an appearance in early summer. Mom cautioned us to stay away from the spray, but other neighborhood children would ride their bikes behind the truck and in one case, one boy passed out while following after the cloud of pesticide. Each household was responsible for burning their own trash, so every home had a fireplace in the back corner of the yard for this purpose. Most of the trash was cardboard and paper. Once I remember mom telling dad that she almost caught her coat on fire trying to light the match on a windy day. Each house also had a receptacle built into the ground for garbage. The township established strict regulations on what could be thrown into the pail. Once a week or maybe twice, the long, green garbage truck would come through the neighborhood. African-American men would carry the pail on their shoulders and heave the contents into the open truck, which we tried to avoid because it smelled so bad. Our first “swimming pool” was a metal sandbox, which held about three inches of water. The plastic, blow-up pools became popular, and the kid who could fill their pool with six inches of water or more commanded status. Through the years, these pools morphed into holding one and two feet of water. David’s parents bought such a pool, and we were in awe. In the 1960s a few neighbors installed in-ground cement pools. These were the days before air-conditioners, and summers could be long, dry and hot. 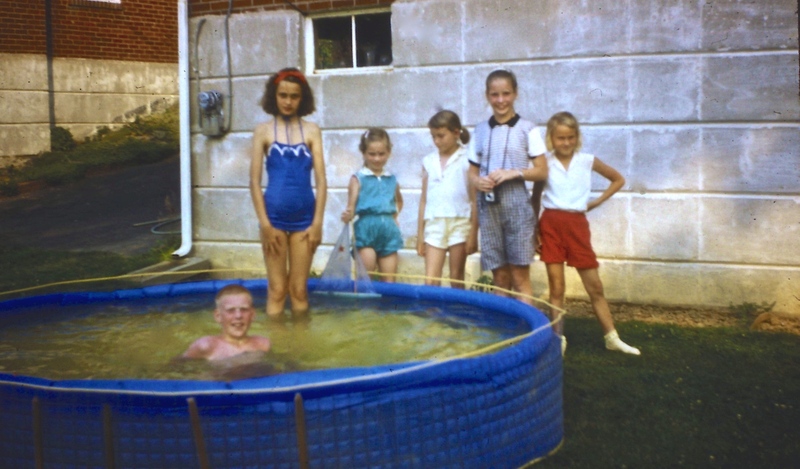 Springfield had no shortage of community pools, and many of the children in our neighborhood learned to swim at the Palm Beach Swim Club, which actually dated back to 1928, built on the corner of Baltimore Pike and Woodland Avenue. In addition to the Springfield Swim Club another pool was located off of Rolling Road. We belonged to Drexelbrook, which had a separate deep end pool. 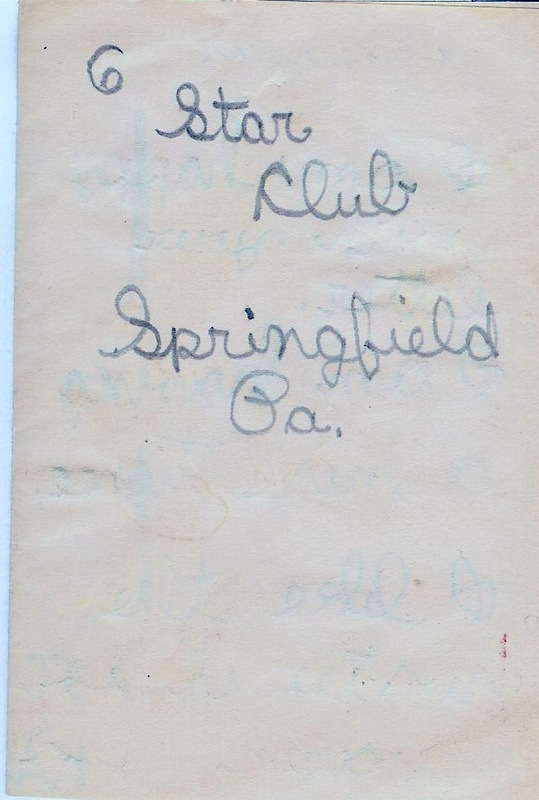 Only the Springfield Club remains in operation today. 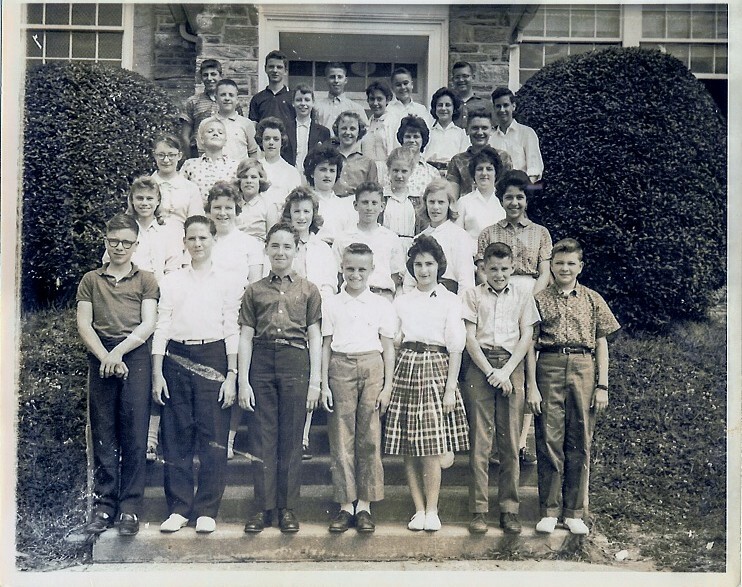 Around 1958, the school district began building the middle school on the plot of land next to our neighborhood. I believe an old tavern on was all that occupied the field. A wooded area lined the field. We were forbidden to venture into those woods, but occasionally we would climb down the neighbor’s embankment and over the trolley line to the path through the forest. If we made it as far as the creek, I considered the venture a success. For me, it wasn’t about being defiant but rather finding the woods so enchanting, drawn to the canopy of trees and the streams. 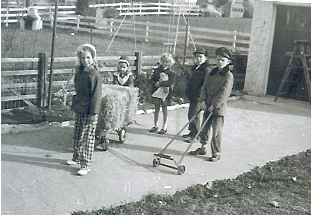 As construction began, my father suggested that I take some pictures before the land transformed into a school yard. With my Brownie camera and friends in tow, we walked over to the field. 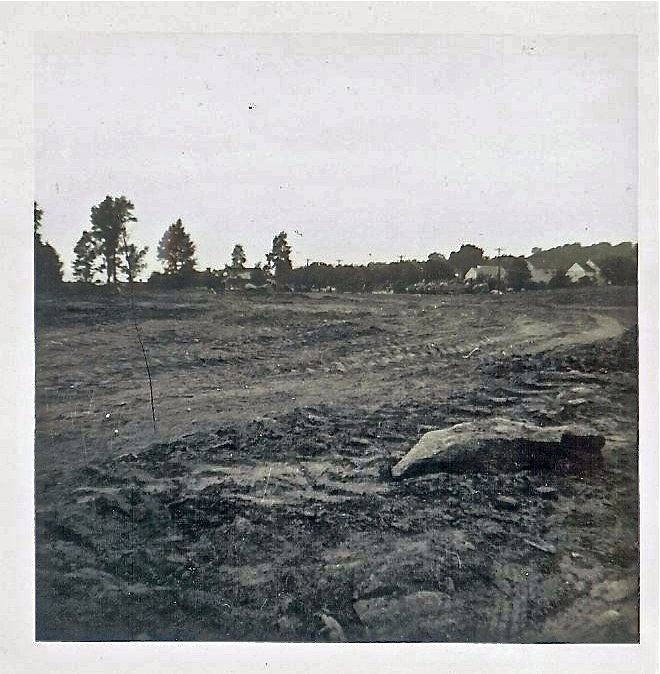 The first picture, taken looking towards Woodland Avenue, shows the field just as the bulldozers began to flatten the land. The tavern still stands to the left, although difficult to see. 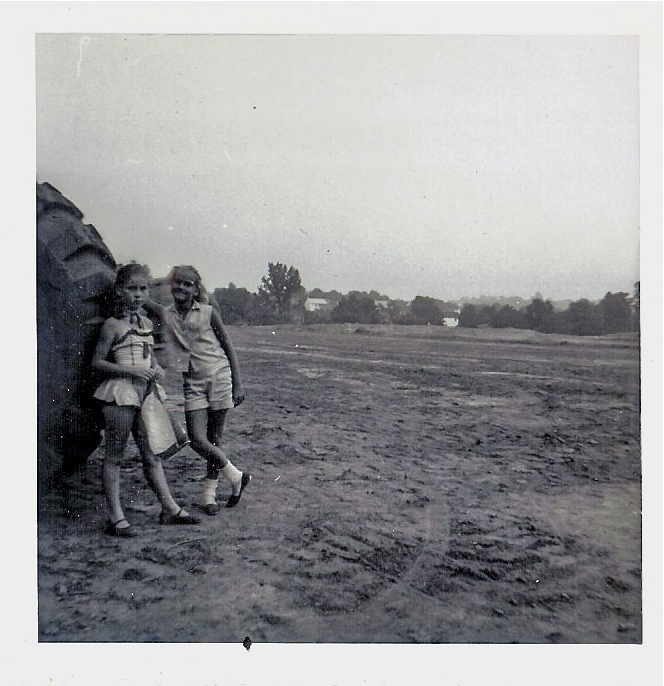 In this next picture my sister and our friend and next door neighbor, Carol, stand by a tire of the land movers. The middle school was eventually named for Carol’s uncle, E. T. Richardson, who was principal for many years. Last photograph shows the view of the school construction from our second story window. 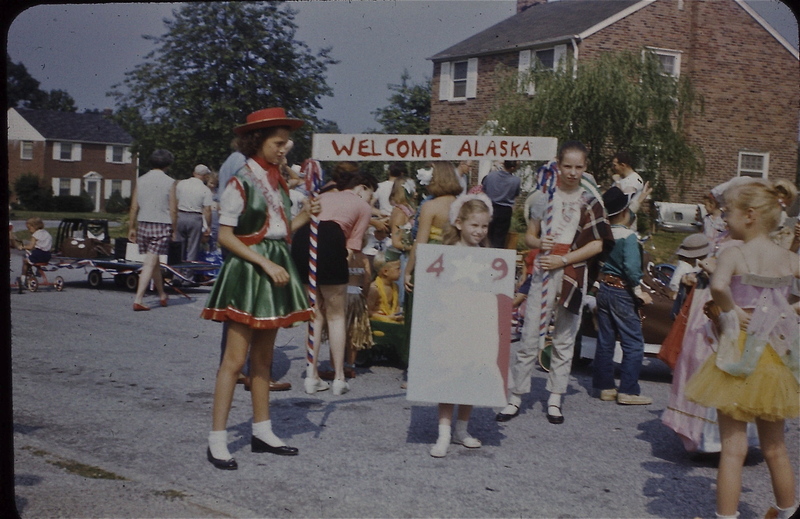 Joan, Jean and I welcomed Alaska as the 49th State during the neighborhood 4th of July parade. Joan was “Miss Arizona” and I was “Miss New Mexico,” the last two states previously admitted to the Union. Not long ago, Joan sent me a reminder of our days back on the block . . . a little note I had written to her, and she had saved for 50 years! Back then we formed our own kids’ club and named it “The Six Stars.” Some of our more ambitious projects involved putting on plays in our basement or garage. We prided ourselves in having real costumes, scenery and music. Disney movies served as our inspiration, and the photograph below shows us taking our bows during the curtain call for Sleeping Beauty. We had to bribe David to play the part of the prince and reminded him he was not to jive the crown by tilting it to the side. For some reason, I remember I forgot to remove the chandelier during the scenes in the forest. Parents contributed cakes and cookies, served at the end of the performance. 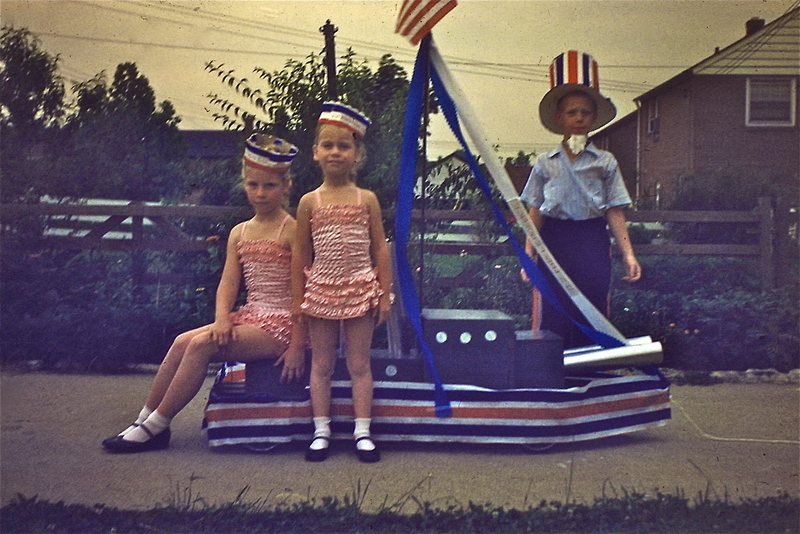 My mother didn’t allow us to sell tickets as she felt it unseemly to charge friends and neighbors. In addition to the plays, we had great fun recreating our own versions of the adult world. We assembled a train car, school, tunnel world and jungle land. Building little houses out of anything we could find lying around the garage was our favorite project. We were frequently accused of constantly making messes, but these were our artistic creations! During the summer, we sometimes would go off to camp, Jean with the twins to girl scout camp, Hidden Falls, and for me, Nik-O-Mahs in the mountains of central Pennsylvania. 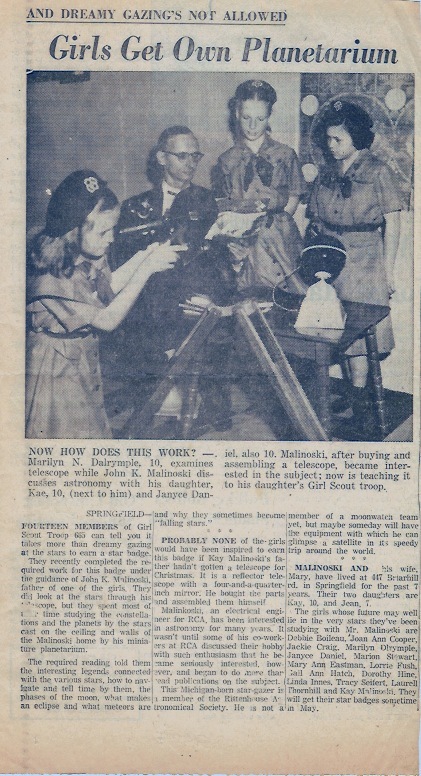 Thanks to Dorothy’s note in the comments section about my father’s astronomy lessons for our Girl Scout Troop 665, in order for us to earn our star badge, I remembered that I had a newspaper article from the Philadelphia Bulletin, “Girls Get Own Planetarium.” Dad would set up the planetarium in our living room, and with a home-made pointer, he would name the star in the constellations. Marilyn, in the photograph, lived in our neighborhood, as well as Dorothy, Joan and Tacy, mentioned in the text. I still have Dad’s telescope, which he assembled, and then built wooden the stand. 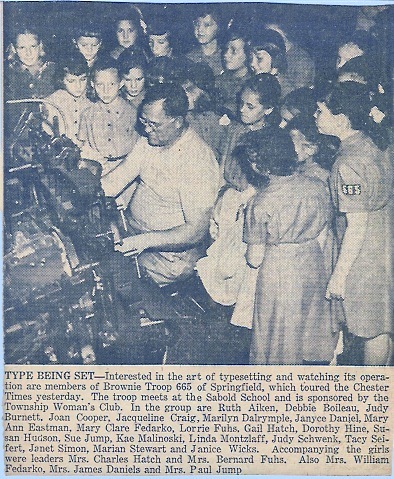 Going back a few years to when we were a Brownie Troop, we had our picture in the paper with a typesetter from the Chester Times. Other girls mentioned from our neighborhood: Linda, and Janice. 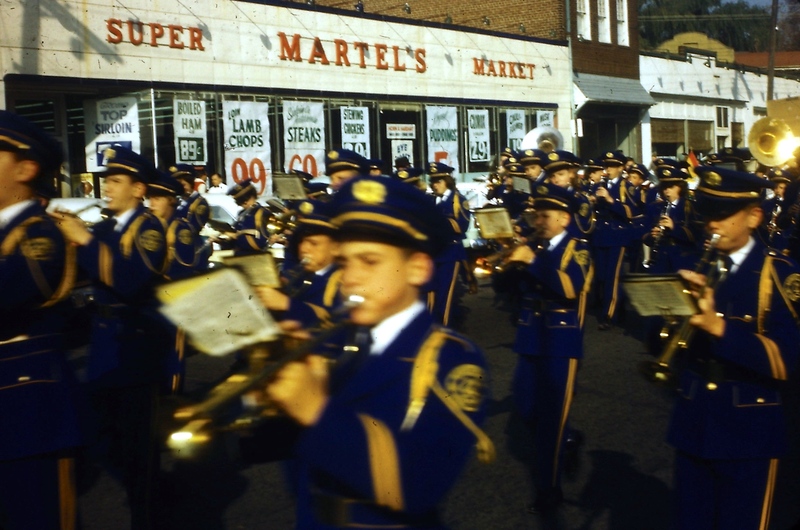 In 8th grade, I joined the marching band and my schedule was changed to “music section” where classes were organized around orchestra and band classes. 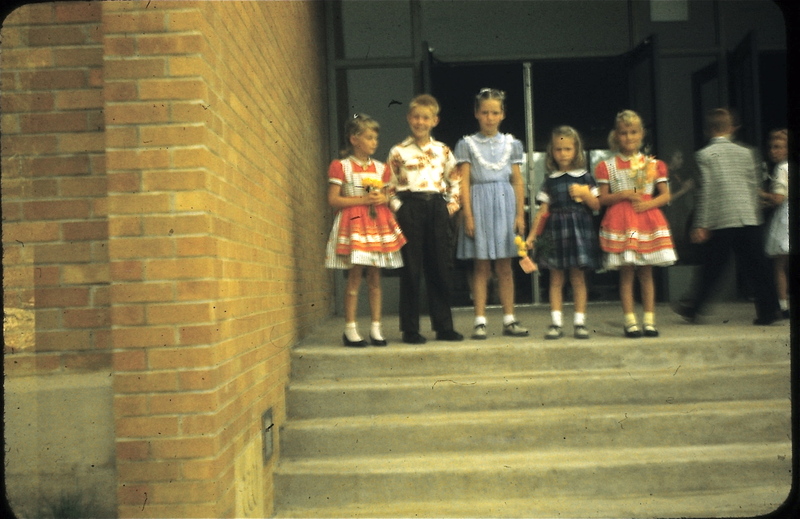 Picture taken at the side entrance of the junior high at that time. 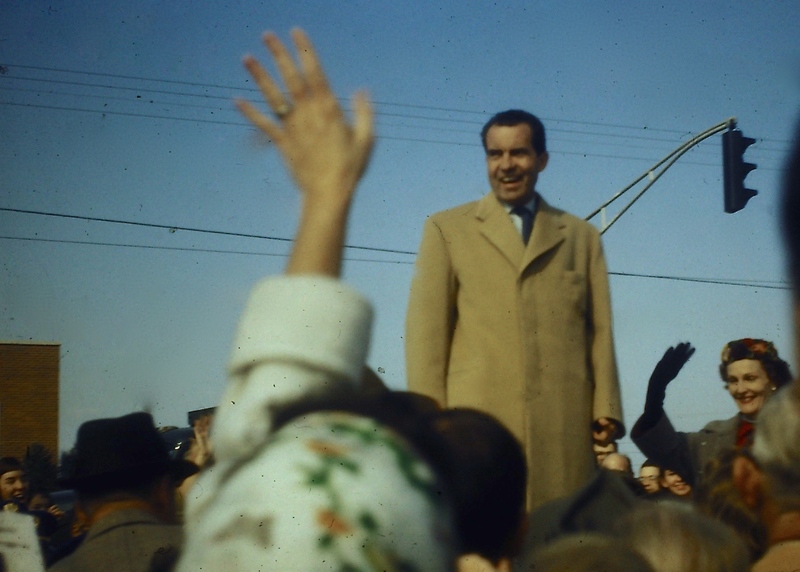 In Fall of 1960, the Junior High Band was sent to Springfield Shopping Center, where then candidate for president, Vice-President Richard Nixon, greeted the crowd. When John Kennedy came through Delaware Country, he did not stop in Springfield but rather spoke at the Lawrence Park Shopping Center in Broomall. 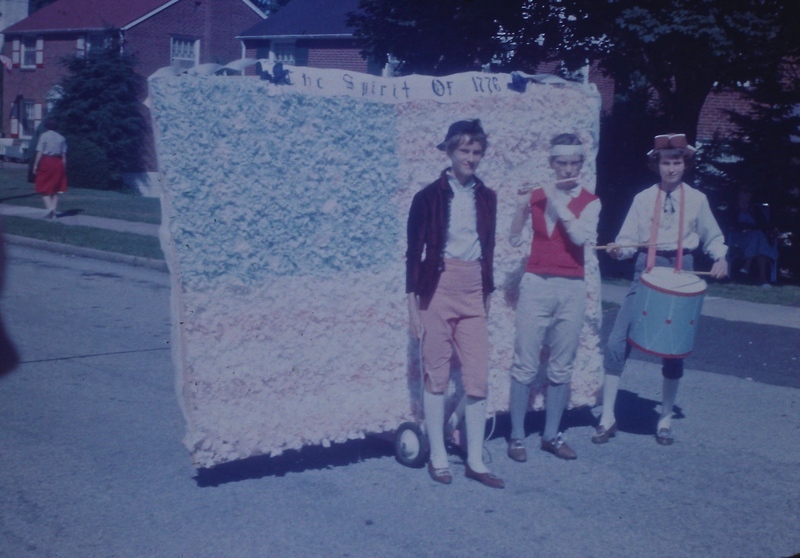 In order to create this flag masterpiece, we stuffed white, blue (and pink, because we couldn’t get red) tissue paper into chicken wire. Our neighborhood girlfriends would gather at our house for a ride to the teen mixers at Holy Cross. 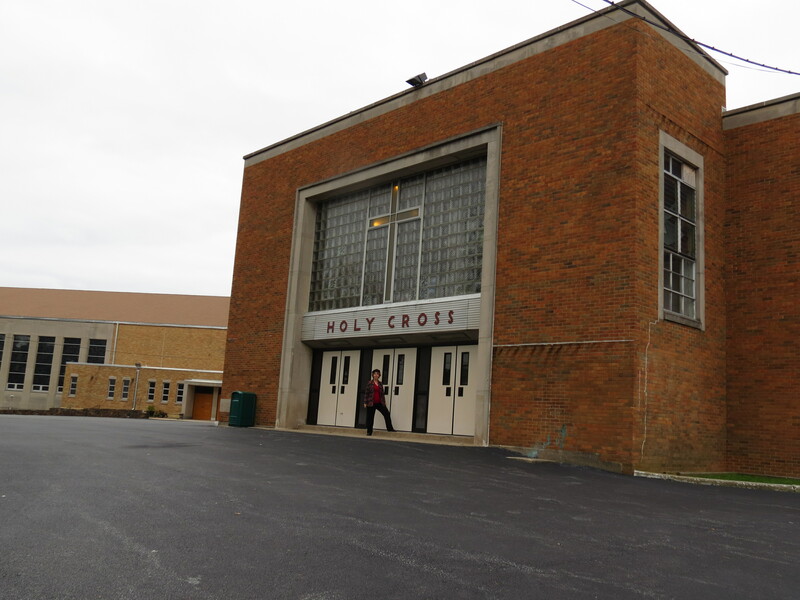 In the mid-1960s, Holy Cross was the place to be on a Saturday night. Most of the teens who attended the dances came from the working class communities in the adjacent neighborhoods, and most were Catholic, of course. We attended public school, so it was a bit of a leap to attend a dance outside of our school where we wouldn’t know anyone. Some of our friend’s parents didn’t like the idea of their daughters going to a Catholic dance, but somehow we convinced them it would be ok. My sister remembers her shocked reaction when she saw smoking going on around the corner of the church. We were somewhat protected in our quiet neighborhood bubble. The Church kept a strict dress code. 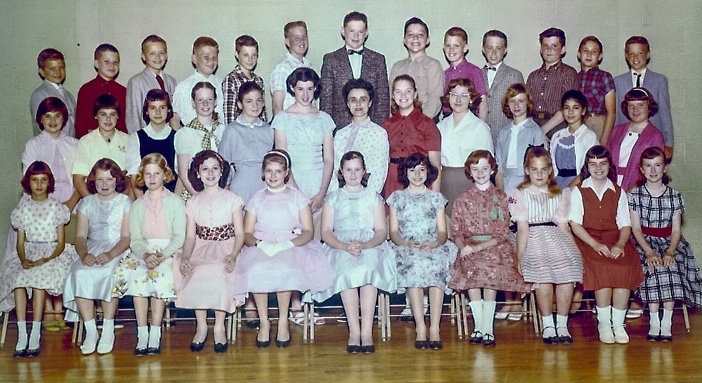 Boys had to wear coats and ties and for girls, skirts or dresses. We would spend all day getting ready: washing our hair in the morning and using those humongous plastic rollers so that our hair would have puff rather than curls. We would sit under a hair dryer bonnet for hours. More daring girls would wear heavy eye makeup and challenge the limits on how short their skirts could be. It was a fine line, and the authorities would send you home, if you crossed it. Looking back, I believe the dress code established a certain decorum, even if we complained at the time. We would join long lines outside the gym to pay our 75 cents to get in, passing by the three or four priests that lined up near the entrance. Everybody danced on the crowded floor; we didn’t have to worry about being a wall flower. When dancing, the boys would cut in front of us, nudging each other out of the way. We had bragging rights depending on the number of boys that would cut in. The temperature would rise through the night, but the boys still had to keep their jackets on. Versions of the Bristol Stomp provided the basic dance steps, and dancers would hit the wooden floor with a collective stomp on the beat. That unison had to be a genre of tribal dancing, and while we danced with a partner, it was really a group dance–and that made it exciting! When they do the Bristol Stomp. Whoa-oh. Ah-ah-ah, ah. When they do the Bristol Stomp. After every dance number, we would escape back to our girl pods and share our analysis. “Wow, that was a cute guy you were dancing with.” “He asked for my number!” “Look, he’s wearing a Beatle jacket.” “Did you see that split?” Boys were considered “hot” if could do a split; and if a guy had a Beatle haircut, he racked up more status points. Oh, yes, about those Beatles . . . reminisces of the Fab Four at Yesterday: Beatle Memories & My Letter from Peter Best. The DJ usually played Doo-Wop music for the slow dances: See the Pyramids Across the Nile, In the Still of the Night, Till Then, You Belong to Me. I remember melting every time the songs played. 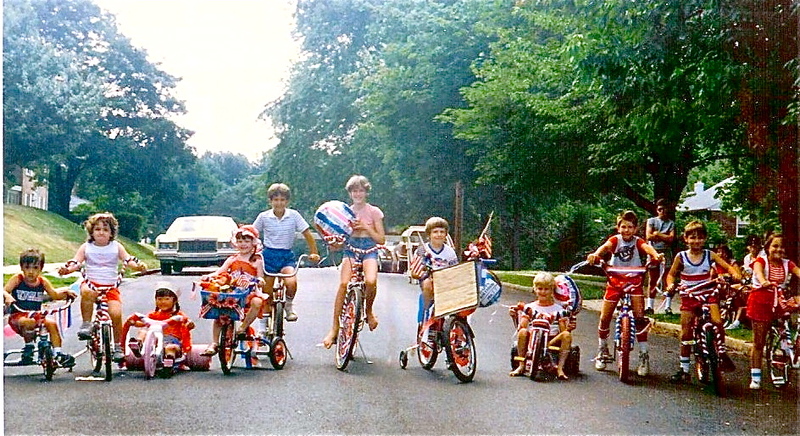 On June 19, 1976, neighborhood residents held their own American Bicentennial celebration, 1776-1976. Neighbors distributed a booklet, which included the activities for the day, the current officers of the association, and a history of the organization. Our family had the unusual situation that my parents moved out of their house in 1970, and my sister and I continued to live in the home. Jean eventually left, too, to start her nursing career in Boston. I married and raised two children in the house where I grew up. As an officer in the Civic Association for a few years, I assisted with the Christmas and Easter activities. I was active in local politics, especially in Bob Edgar’s 1974 campaign for congress. The neighborhood tradition continued with visits from Santa via the Springfield fire truck and company. After forty years, I moved away from Briarhill Road. I thought that I might stay in the house until I could turn it over to my children, but a number of circumstances changed the course of life events, which prevented that outcome. As it turned out, Matt (pictured above) lives in Joan’s house and his sister, Stacey and husband, Mark, bought our house. A few of the original residents still live on the block. I will leave the history of Woodview Farms neighborhood to others to record the third generation, as I say goodbye to my childhood home.